Conflicts between refugees are becoming increasingly frequent, because of the high tensions in Greek camps. Those tensions are often caused by conflicts between ethnic groups, resulting in frequent injuries from the use of stones and knives, as well as larger or smaller disasters in infrastructure and equipment centres. The majority of refugees are given false hopes by traffickers who, said the refugees and their families, upon entering the EU, would enjoy benefits ensuring them a prosperous and comfortable life. However, the refugees soon have to face reality – which is far from convenient or prosperous. This leads to despair, misery, anger and violence. It is indicative that, when the sun goes down, the FRONTEX officials on the Islands, NGO workers and all kinds of volunteers typically leave the centres, fearing for their personal safety. While some NGO workers support revealing these incidents, publicizing of aggressive behaviours and violent acts, others believe this may intensify the concern of the Greek public, eventually fuelling xenophobia and racism. Even the managers of the centres have been adjusting to this climate of “omertà” (agreed silence). Until recently, Greek society has generally shown an admirable moral and material solidarity with the refugees, despite the sharp economic crisis Greece is experiencing. The continuous and on-going lock-in, however, and the large crowds, combined with the almost daily violent episodes, have already begun to cause social reactions. The Greeks have begun to experience the refugee crisis not as a humanitarian problem, but as a threat to their traditional way of life. The diffusion of insecurity leads to a regression of public opinion into xenophobic attitudes. There is a long delay in relocating refugees to other EU countries. According to an estimate by the Greek Commission, the Turkish-Greek agreement demanded that more than 6,000 refugees leave Greece every month for relocation to other EU states. Based on that estimation, more than 36,000 refugees should already have been relocated. However, in reality, the EU-states have approved a total of 6,000 refugees, only 3,407 of whom have been relocated so far. Despite the fact that the groups of refugees from Turkey have reduced drastically, especially in the last half year, the refugees did not vanish at all. According to statistics, July 2015 brought a daily average of 61 refugees. In August 2015, that number became 110 per day, while in September 2015 the rate was more than 130 refugees a day. Though Greek authorities send a few dozen refugees a month back to Turkish coastlines, it is understood that even these small groups are sufficient to keep the existing host structures overcrowded. If, however, someone adds another 8,000 refugees who managed to flee Greece illegally in the north, then the number becomes astronomical, especially for a country with reduced capabilities of maintaining its national border control. The main street is the unattended passages parallel to the Balkan corridor. Most refugees cross this border towards FYRO Macedonia and continue towards Serbia. Fewer choose the road through Albania, while a small number still use the sea route towards Italy. The closure of the Balkan corridor has shrunk the flow of migrants to the Greek Islands, but has also increased the flow from Turkey to Bulgaria, while the Africans prefer the sea route from Libya to the Italian island of Lampedusa. Politically, the long delay in the relocation of refugees from Greece to other EU countries is due almost exclusively to the unwillingness of its partners. Most member countries officially do not deny the relocation, except from Visegrad countries such as Hungary, Czech Republic, Slovakia and Poland. The Commission had attempted to exert pressure on member states that do not respond, instating a fine of 250,000 euros for each refugee reaching their borders, and denied entry. Despite the Commission’s attempts, however, and the positive answer to the demands of member states, the EU authorities still pressure Greece and Italy to continue to accept the refugees without any convincing forecast about the future or, even worse, without considering the implications. Domestically, the Greek Government and Greece’s Prime Minister Tsipras seem to be unable to accelerate the pace of the refugees’ relocation. However, the Greek authorities should accelerate the pace of processing applications for asylum in order to multiply the number of deportations to Turkey. The EU-Turkish agreement is crystal clear: The new entrants’ applications for asylum will be processed on the Islands. The delay in processing applications has turned the Greek Island into hot spots for identification and registration centres and into accommodation centres with unspecified times of stay. This unacceptable situation has negative consequences. First, this situation causes unavoidable side effects in relatively small societies, while promoting the decline in tourism, which is the main source of income for Greek locals. The already complex procedure is becoming even worse while refugees from safer countries such as Pakistan, Bangladesh, Morocco, etc., submit their requests for asylum, mainly to obtain years of legal residence due to the Greek State’s inability to examine their applications rapidly. Thus, new immigrants coming to Greek coastlines prefer to apply for asylum rather than be sent back to Turkey. Because each request is examined separately, there is the assumption that the system will flood due to the large number. The European Asylum Support Office promised to send 300 experts to Greece. So far, there have been only 180. Considering the above, it is quite obvious that Greece is in the middle of micro-politics while the State’s national security policy is at stake. But there is a paradox. The closure of the Balkan corridor has made the way to the Greek Islands unattractive. Refugees see Greece as a transit country and don’t want to be locked in here. That is why the great majority is unwilling to enter into this adventure – even if the traffickers and the Turkish authorities encourage them in this direction. Thus, even though some refugees do not want to come to the Greek islands, they have no choice but to come. 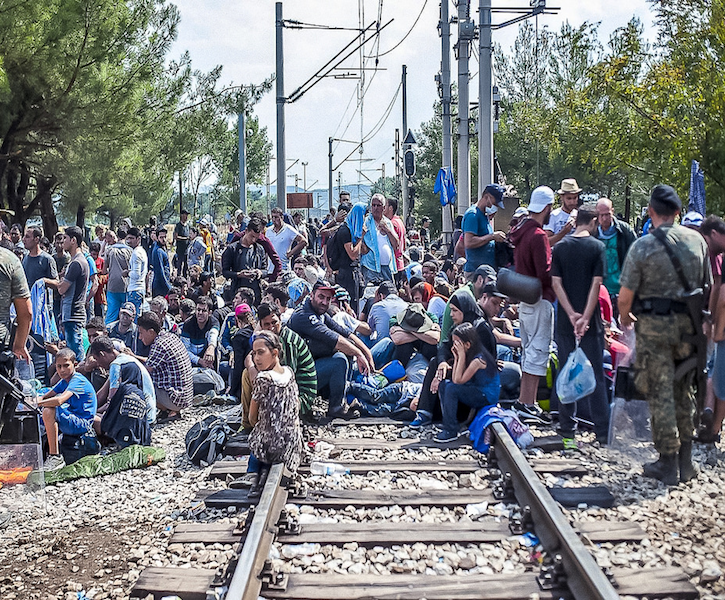 Photo: “Refugees wait to cross the Macedonian-Greek border” (2015), by Freedom House via Flickr. Public Domain. Is Ukraine Going to Lean Towards NATO after the Recent Violence in Avdiivka?